SILVER SPRINGS, MD – NOAA’s annual Fisheries of the United States 2016 report released last month shows stable national fisheries in both volume and value, with several ports in the region ranked highly. Overall, the US landed 9.6 billion pounds of fish at a total value of $5.3 billion. “Our nation’s fisheries, landings, and aquaculture remain a strong contributor to our economy,” said Ned Cyr, director of NOAA Fisheries Office of Science & Technology at a recent press conference to announce the report’s findings. 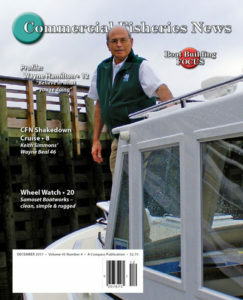 “Our goal is to build healthy, sustainable fish stocks that allow our commercial and recreational fishing industries to remain strong contributors to our economy,” Cyr said. To view the report in its entirety, visit <www.fisheries.noaa.gov/resource/document/fisheries-united-states-2016-report>. Also, look for Fisheries Economics of the US which details the economic impact of fisheries and related sectors, including employment, sales and value-added impacts. The port of Dutch Harbor, AK ranked highest in volume of fish landed for the 20th consecutive year – with 770 million pounds – and ranked second in landings value, at $198 million. 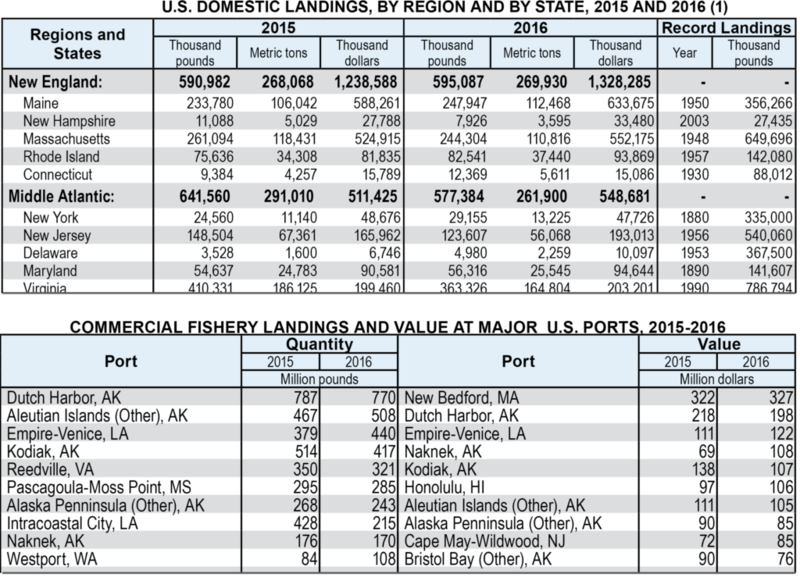 Alaskan ports took five out of the Top 10 rankings in landings and account for 3.4 billion pounds of the total national landings. However, in this region, the port of New Bedford continues to rank highest in value of catch landed for the 17th year – at $327 million in landings, up $5 million over 2015, due in large part to the high-value sea scallop fishery. Total New Bedford landings in 2016 were 107 million pounds.